Mini Quaker Samplings [E6409] - $12.00 : Yarn Tree, Your wholesale source for cross stitch supplies. Cross stitch pattern by With My Needle. Did you know that the Quakers were among the first to realize the importance of education of both boys and girls. Needlework was included in the curriculum for girls. These two samplers reflect the same simplicity and moderation the girls practiced in their lives. 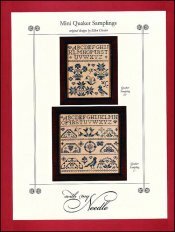 The first sampler features the alphabet stitched at the top with Quaker motifs stitched below. A large bird stands next to the motifs. The second sampler features the alphabet stitched at the top with rows of motifs stitched below with chirping birds & fluttering butterflies. Although simple, these "Mini Quaker Samplings," are beautiful. Stitch counts: Quaker Sampling IV 73W x 93H, Quaker Sampling V 103W x 102H.